It is an annual ritual in my house. The first time I push aside the leaves and mulch in our garden and discover tiny green shoots in the earth, I call for each of my kids. We stand around in awe and anticipation, just spending a few moments looking down at our first sign of spring. It feels so wonderful, so hopeful, to see physical evidence that the coldness and deadness of winter will be ending soon. So far, my youngest daughter is the only one I haven’t yet put to work in the garden. Although, even she was beginning to carry weeds to the wheelbarrow and dig into the soil last year. When my baby girl sees these little green leaves, it may seem almost like magic. The rest of us, though, know that before we can enjoy the fanfare of brightly colored spring tulips and daffodils, we had to plow up the earth, plant the bulbs, weed, and protect them from weather that is too harsh. Our efforts didn’t produce much at first. These bulbs didn’t grow all fall and into the winter. We’ve endured a full season of drab brown and gray. 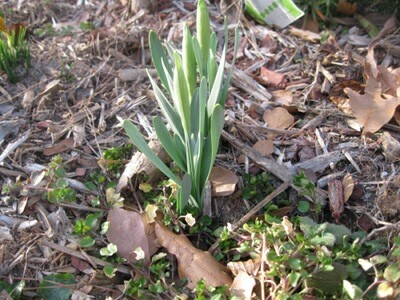 It’s only now, months after their original planting, that we see evidence of growth and life. As Christians, it’s easy to forget that in order to grow and produce life, we have to let God work in our hearts. It’s sometimes painful and we don’t always see the purpose of this work right away, but our fruitfulness depends on it. Last year, I felt God turning over the soil of my heart, sifting out the deep-rooted sins that have to be removed before I can produce fruit. From the surface, I may have looked like good soil before this. Sometimes it’s the sins that we can easily hide from others that are the hardest to dig out. Yet, He knew about those hidden sins that I manage to keep so private—sins like pride and jealousy, and He’s been digging them out with firmness and yet with so much grace. We may think we’ve given over all of our lives to God. We may see some fruit and think that it’s enough. Yet, God will always ask us to draw closer to Him, to give more of our lives, to break up unplowed ground and allow Him to work in the areas we’ve previously kept from His hand. Sometimes in real life, I’m tempted to just dump a whole bunch of mulch on top of the weeds, hoping they suffocate under the load. It’s that way in my heart, too. It seems easier somehow to just dump a righteous façade on top of my bad attitudes, lack of trust, and other heart problems and hope that those sins remain hidden. Any good gardener, however, will tell you that the only way to get rid of weeds is to completely remove them, roots and all. It’s work—hard work—but it is what needs to be done to ensure the quality of the soil and to produce the best harvest. In Hosea 10:2, it says, “Sow for yourselves righteousness, reap the fruit of unfailing love, and break up your unplowed ground; for it is time to seek the Lord, until He comes and showers righteousness on you” (NIV). If God has been urging you to “break up your unplowed ground,” allow Him to work. It might hurt as He uses circumstances and other people to break up the hard rocky places in your heart. Yet, when He has uprooted the weeds of sin in your life and turned over soil, unsettling your ground and disturbing your status quo, “sow for yourselves righteousness . . . and seek the Lord.” Protect your heart from those same sins taking root again by filling up that dirt with His Word and with time spent in His presence. I always say I learn the most about life in my outdoor work. Each years leaves must be removed. It can be a tediuos job-one layer gets done and then another layer appears. God shows me how important maintence is not only in yard work, but in stuff(cars etc). He says in order to be most productive for Him, I must maintain my relationship with Him oftentimes minute by minute! I love your mediations!